Integromat distinguishes five types of modules: Actions, Searches, Triggers, Aggregators and Iterators . The two latter ones are intended for advanced scenarios. Actions are the most common type of module. A typical action module returns just a single bundle which is then passed on to the next module for processing. Action modules can be placed at the beginning, middle or end of a scenario. Scenarios can contain an unlimited number of action modules. 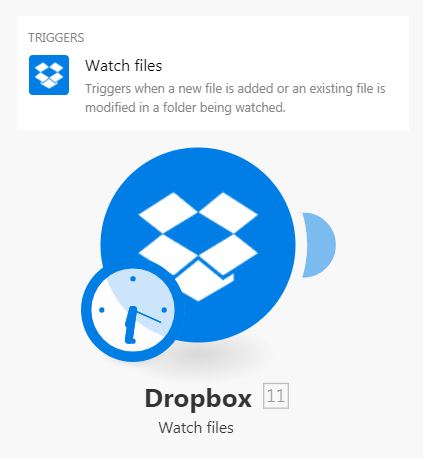 Dropbox > Upload a file sends a file to a selected Dropbox folder and returns its identifier. Image > Resize receives an image, resizes it to specified dimensions, and passes the resized image on to the next action. Google Analytics > Create a report gets information about web traffic and passes it on for further processing. A typical search module returns zero, one or more bundles which are then passed on to the next module for processing. Search modules can be placed at the beginning, middle or end of a scenario. Scenarios can contain an unlimited number of search modules. Monday > List pulses in all boards returns all account's pulses. Trigger modules generate bundles when there has been a change in a given service. The change can be a creation of a new record(s), deletion of a record(s), update of a record(s), etc. Integromat distinguishes between two types of triggers: Scheduled triggers and Instant triggers. Every trigger can return zero, one or more bundles which are then passed on to the next module for processing. Triggers can be placed only at the beginning of a scenario. Each scenario can contain only one trigger. Scheduled triggers are designed to regularly poll a given service whether there has been a change since their previous run. So you will typically schedule a scenario containing a scheduled trigger module to run periodically by selecting for example At regular intervals option from the Schedule setting panel. If there is a change the trigger will return bundles containing information about the change. If there is no change the trigger will output no bundles. Scheduled triggers allow you to select the first bundle they should output via the epoch panel. The panel is displayed automatically after you save a trigger or when you make a substantial change in the trigger settings. You can also display the panel by right-clicking the module and choosing "Choose where to start" from the context menu. NOTE: Settings made in the epoch panel affect only the first execution of the module. Once the module is executed, it will remember the last outputted bundle and the settings made via epoch panel will be voided. Instant triggers enable the service to notify Integromat about the change immediately. You will typically wish to schedule a scenario containing an instant trigger to run immediately by selecting the Immediately option from the Schedule setting panel. See also Webhooks for further details on how the incoming data are handled. 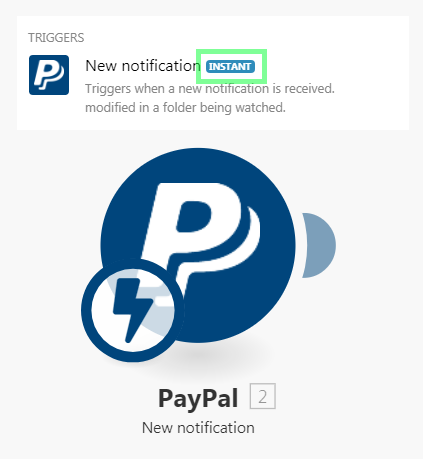 Paypal > New notification returns new payment notifications. Aggregator is a type of module that accumulates multiple bundles into one single bundle. Every aggregator returns only one bundle which is then passed on to the next module for further processing. Aggregators can be placed only in the middle of a scenario. Scenarios can contain an unlimited number of aggregators. Iterator is a type of module that splits arrays into multiple separate bundles. Every iterator returns one or more bundles which are then passed on to the next module for processing. Iterators can be placed only in the middle of a scenario. Scenarios can contain an unlimited number of iterators.